SEATTLE--(BUSINESS WIRE)--Dallas/Fort Worth area coffee drinkers, synchronize your alarm clocks: Seattle’s Best Coffee, a featured brand within Starbucks Corporation (NASDAQ:SBUX), announces the simultaneous opening of 10 drive-thrus throughout Dallas/Fort Worth at 4:30 a.m. on Mon., May 20. Seattle’s Best Coffee invites customers to start a new morning routine by heading to their nearest drive-thru for a free hot or iced brewed coffee of any size during Free Coffee Week, May 20-26. Drivers pulling up to Seattle’s Best Coffee beginning May 20 will find a menu that includes high-quality arabica coffee beverages and dashboard-friendly foods with 12 different “combos” priced under $5. The combos offer quick picks: a medium cup of coffee or soft drink paired with a hearty egg sandwich on a biscuit or muffin, stuffed pretzel melt or handheld sweet or savory “Tasty Pies.” In addition to mochas and lattes, those looking for a treat can choose from many dessert-inspired specialty coffee drinks such as Birthday Cake Lattes and S’mores Mochas, available hot, iced or frozen. Fans can get a 12 oz. specialty drink FREE by going to the Seattle’s Best Facebook Page and emailing three friends to “visit Seattle, TX” during Free Coffee Week. 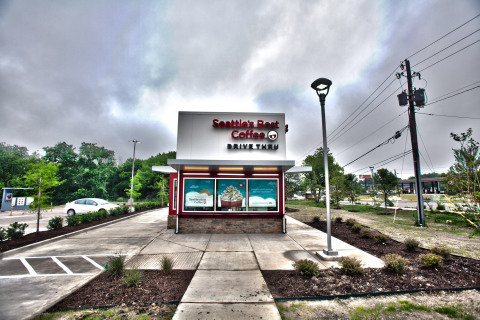 Commuters can easily find the 10 new Seattle’s Best Coffee drive-thrus roadside at busy intersections and outside of popular shopping centers throughout Dallas/Fort Worth, with bold red exteriors and prominent signage. The 10 locations are listed below and are open from 4:30 a.m. to 10 p.m. Monday through Friday and 6 a.m. to 10 p.m. on the weekends. 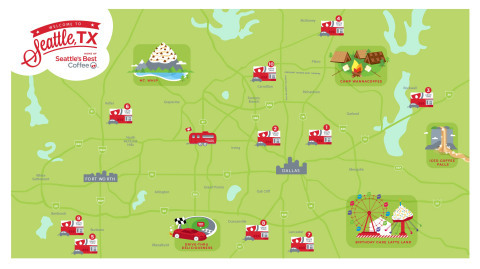 Visit SeattleTX.com for more information. 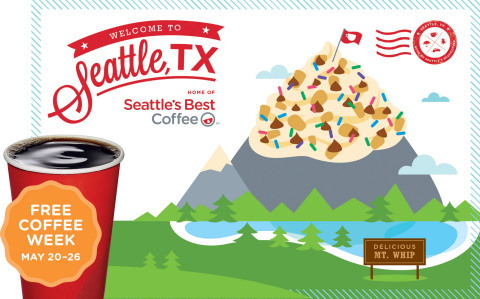 Dallas/Fort Worth – one of the fastest growing and most populous markets in the country1 – was selected as the first market for the multi-store expansion of Seattle’s Best Coffee drive-thru following the exciting launch of the concept in Seattle last fall. The new locations opened in Dallas/Fort Worth with speed and efficiency, thanks to a new small footprint design and innovative real estate strategy. Using this model, the brand significantly cut its market entry time, reduced initial investment costs and developed locations that previously were not suitable for a traditional sized coffee shop. The 10 locations opening “overnight” on May 20 were built in DeSoto, Texas, before being transported on flatbed trucks to their current locations across Dallas/Fort Worth. In total, the 10 new stores employ approximately 150 full- and part-time partners who underwent intensive training for more than 30 hours each to prepare to provide fast, friendly service worthy of Seattle’s Best for the synchronized opening. Seattle’s Best Coffee LLC has been roasting premium coffee since 1970 and today roasts more than 20 million pounds of coffee every year and millions of cups of our coffee are served every day. A freshly-brewed cup of 100% arabica coffee from Latin America, Seattle’s Best Coffee is currently available in more than 50,000 locations, including cafes, college campuses, restaurants, hotels, airlines, cruise ships, grocery stores and movie theatres. Seattle’s Best Coffee is a featured brand within Starbucks Corporation (NASDAQ:SBUX). For more information, please visit Seattle’s Best Coffee online at www.seattlesbest.com, become a member of the coffee community at www.facebook.com/SeattlesBestCoffee or follow Seattle’s Best Coffee on Pinterest for unique coffee inspiration at www.pinterest.com/seattlesbest.